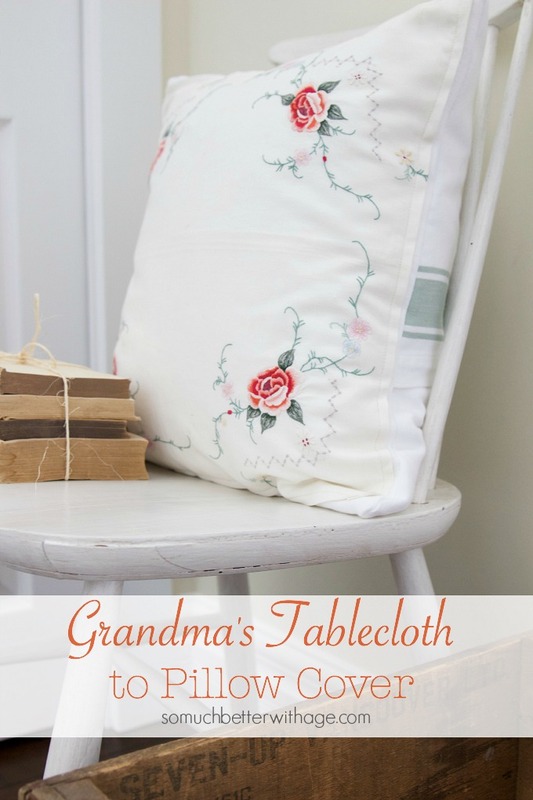 How I transformed my Grandmothers’ sentimental tablecloth into a beautiful pillow cover. 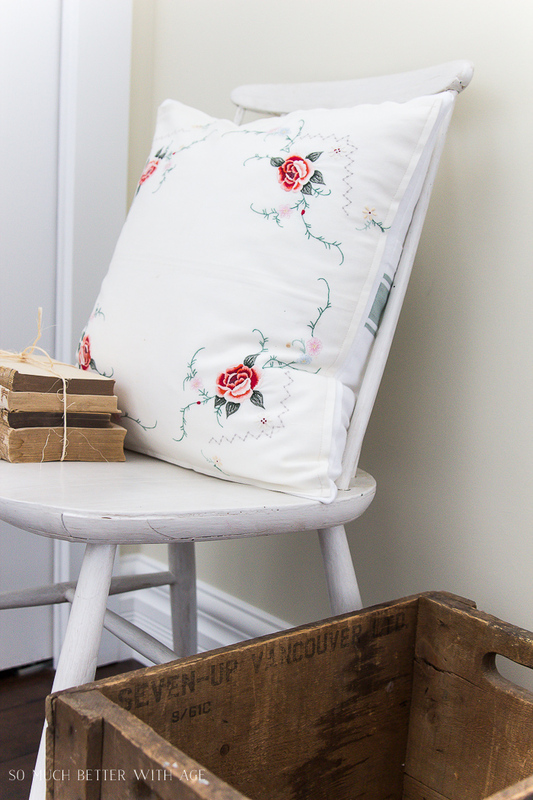 I love hanging on to some sentimental things but I hate hoarding. I’m always purging but just can’t let go of special items. Like a tablecloth my grandma made. She did all this beautiful needlepoint. I dislike using it as a tablecloth for fear of staining it and parts of it were frayed near the edges and didn’t want to ruin it by washing it. So I had the idea of turning it into a pillow. 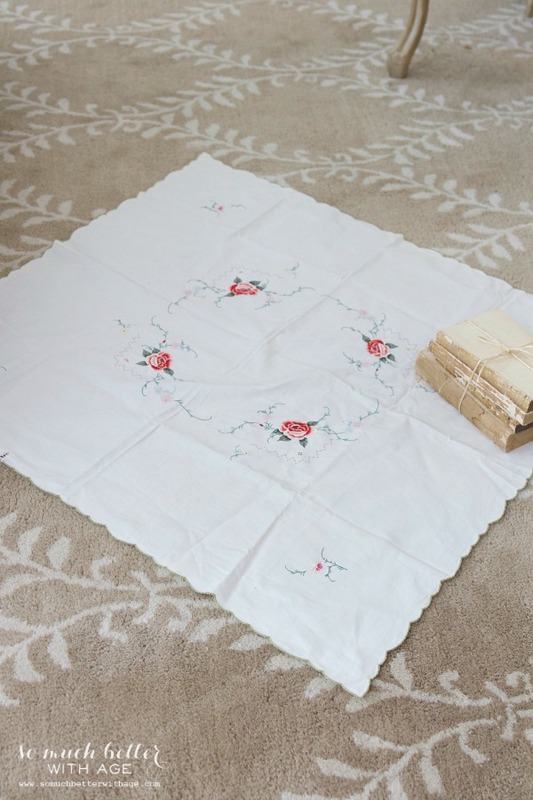 It wasn’t a very large tablecloth, just perfect for a side table or an overlay over a larger tablecloth. There were some holes along the edges and a few stains by the time I received it. I love the delicate flowers and stem details. It’s so darling. 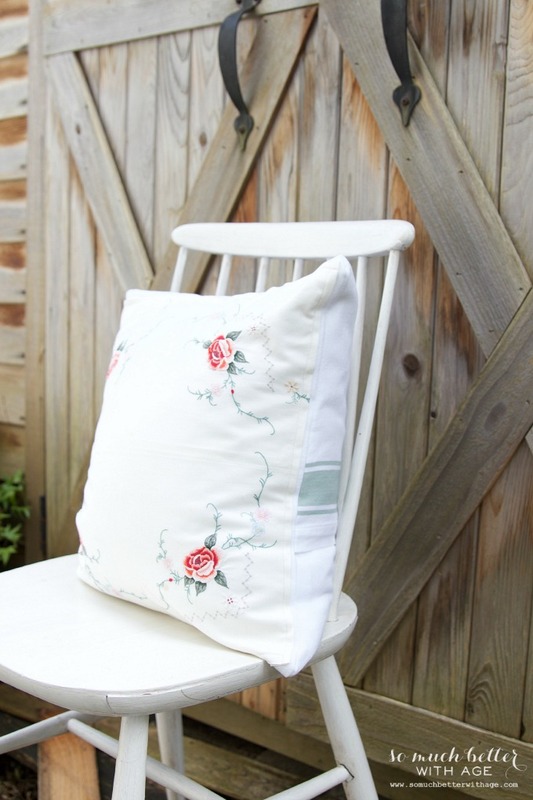 Following my own envelope pillow cover tutorial, I decided a square of the tablecloth stitched to the front of the pillow cover would be best. 1. I did the awful task of cutting the beautiful tablecloth. I cut out an 18 x 18″ square. 2. 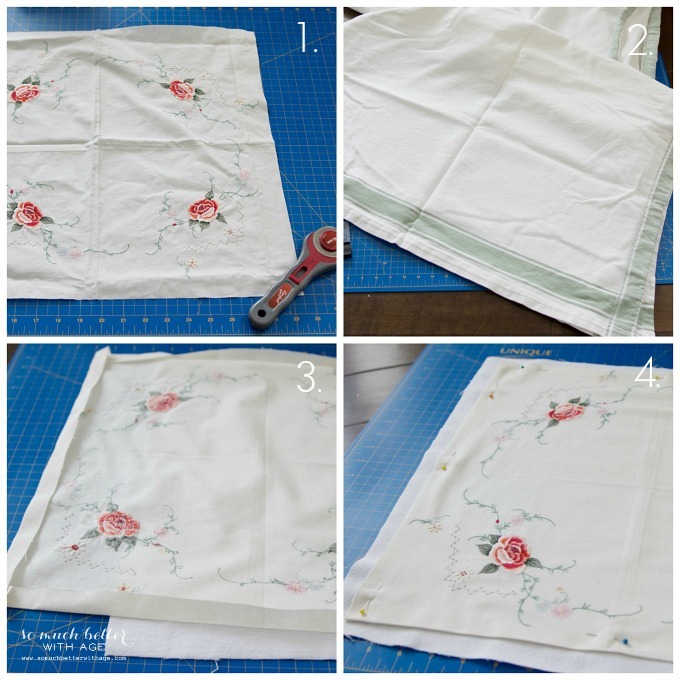 Cut two pieces 18 x 13″ each (I used another old tablecloth making sure one piece had a stripe). 3. 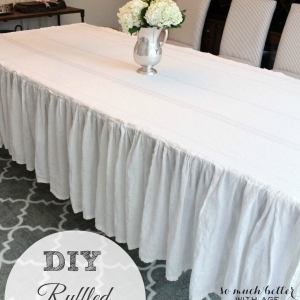 Fold over an inch on all sides of the tablecloth square and iron down. 4. 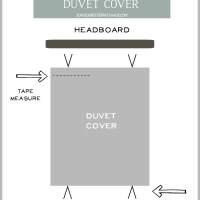 Pin the ironed piece to the 18 x 18″ square. Stitch into place. 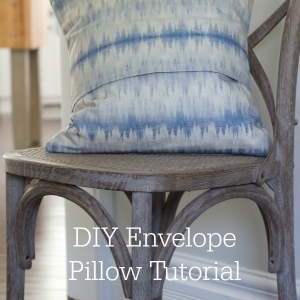 By following the rest of my envelope pillow tutorial, you can complete the pillow cover. 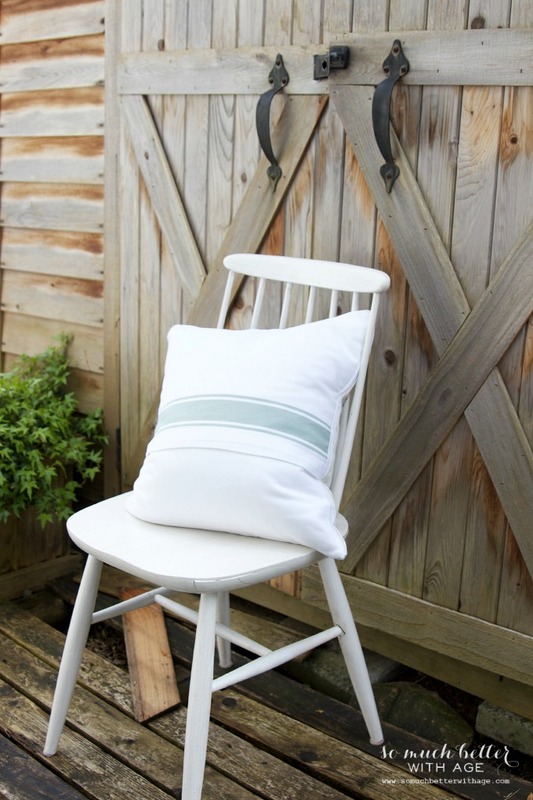 Side note: when using a stripe fabric like I did, you’ll want to stitch that stripe side down first! What do think? I love the finished results. 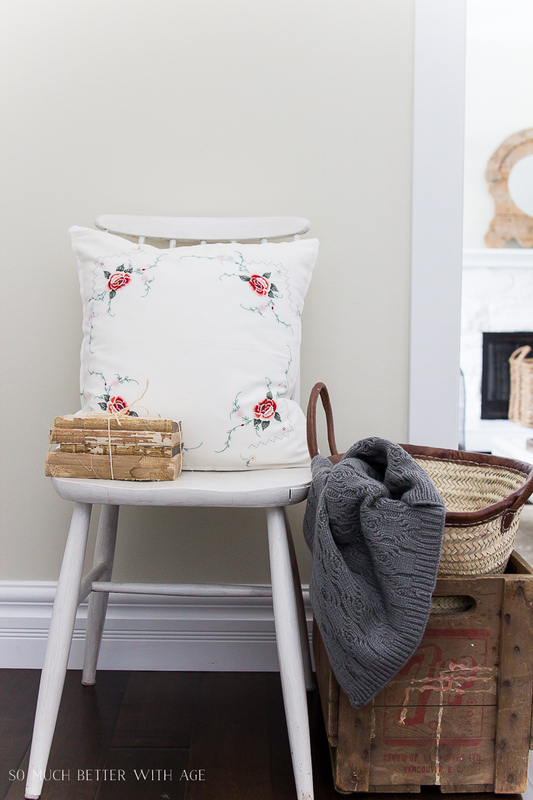 It’s a great way to add your sentimental pieces to your decor. Your grandma was incredibly talented. I have stuff my grandma stitched, but it isn’t anything that beautiful. It is so nice that you found a way to preserve her work in a way that you can use around your home. Can’t wait to see pictures of your new place! This is lovely! 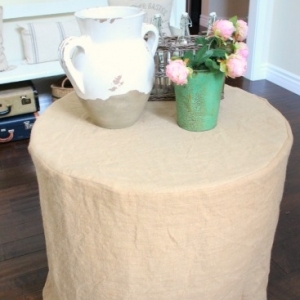 Very good repurpose of tablecloth… you can even use the napkins! Love the pillow!! So pretty!! 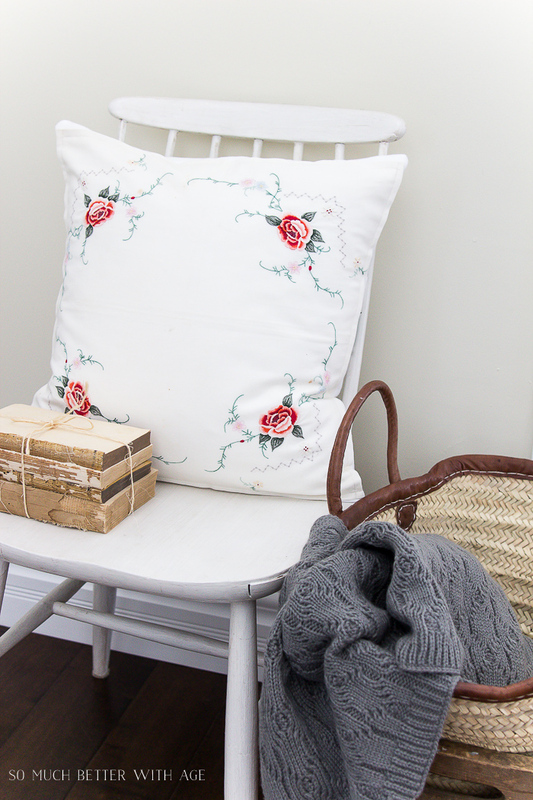 What a beautiful way to repurpose a treasure from your grandmother. I have several treasured tablecloths that were made for card tables. I may have to go through them and see if I can repurpose any of them. This one made a beautiful pillow. I would love it if you would stop by and share it over at my new link party at Celebrate and Decorate. Oh, this tablecloth would be the perfect size for a card table. I wonder if that is what it was originally for? Thanks so much, Chloe! Beautiful Jamie! 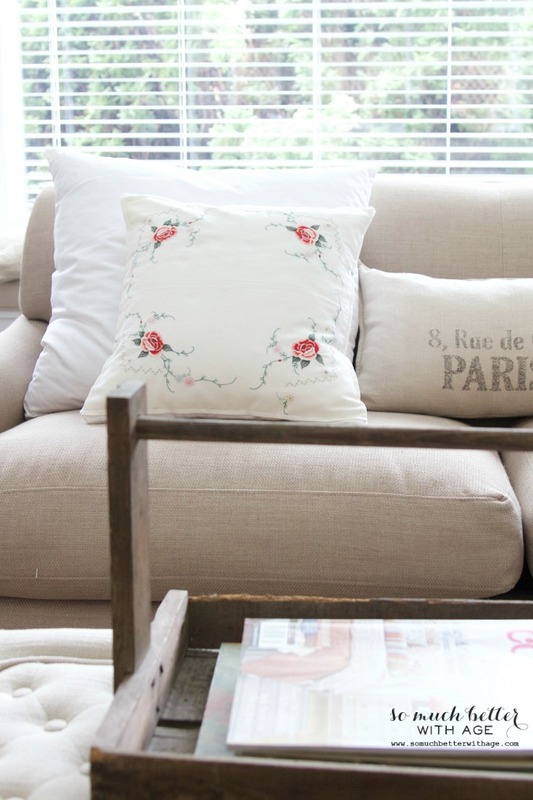 What a great way to preserve and incorporate a sentimental treasure. Love it! 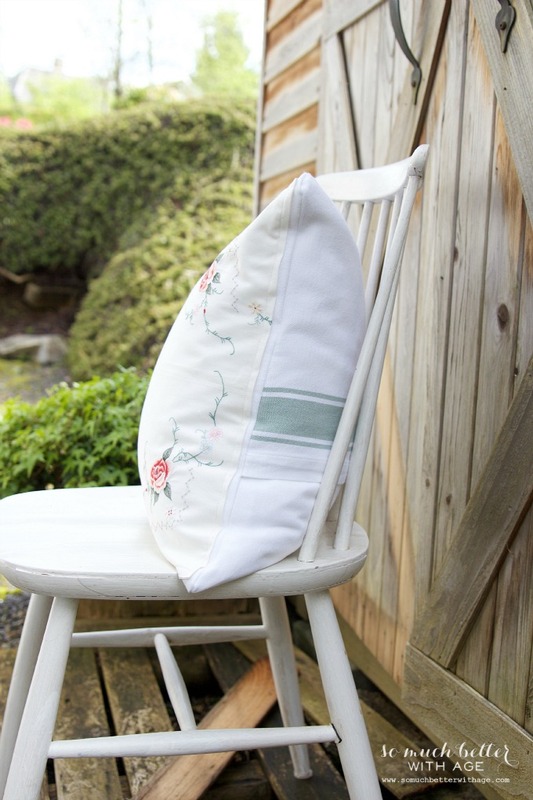 What beautiful workmanship and what an awesome idea turning it into such a pretty pillow! I love this idea. I also have a tablecloth from my nan that sits in the drawer because I don’t want to ruin in. So cute! 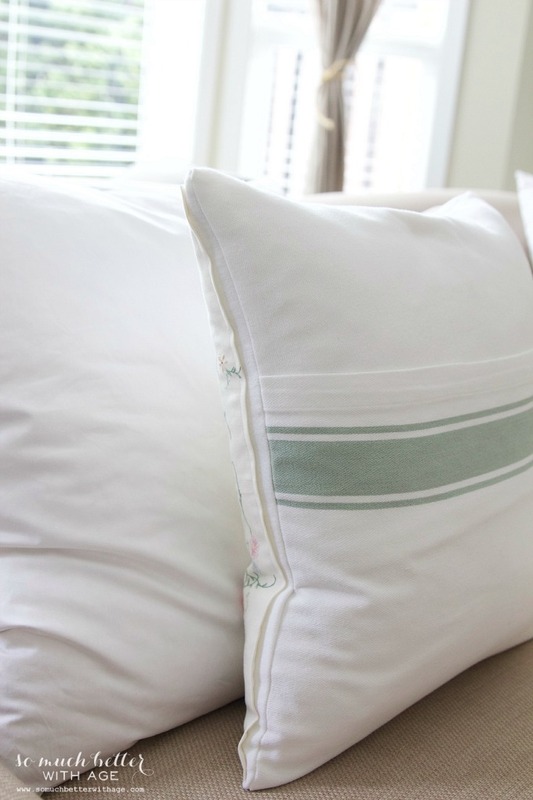 What a great way to save sentimental fabrics, especially partially stained ones. Thanks for sharing! Great idea! 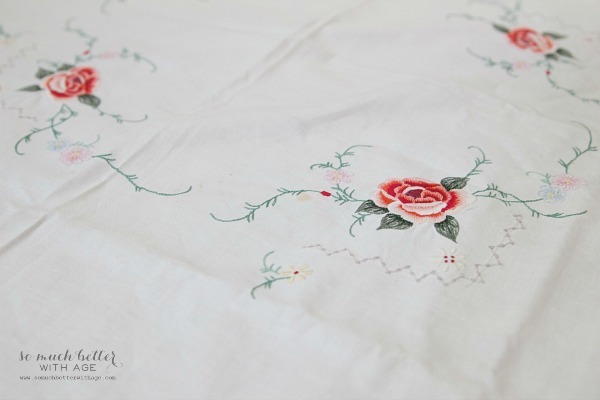 I have some tablecloths from the 50’s that belonged to my mom and I never use them for the same reasons. Might have to think about making some pillow covers! That’s how this started, I never wanted to use this tablecloth. You should definitely try it, Marty! I love it too, Heather. Thanks! 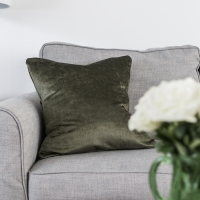 Love this pillow, it’s simply beautiful. Also love that you used your grandmothers homemade tablecloth! Priceless and oh so precious! Thanks so much, Debbie. I really love it too, so special.